Nothing says more about a supplier than how they respond after the sale! Service is the key element to ensure long term customer satisfaction and it enables us to grow our relationship as we are committed to this cause. At Eagle, our goal is to not just receive your first order but to earn the next one and the next. We understand that to do so, we must provide not only superior equipment but to stand behind it with solid support and service. Our team is dedicated in providing service to you in many forms. From on-site at your facility to phone, email, and web links, we can offer a life-line of support at most any hour of the day. 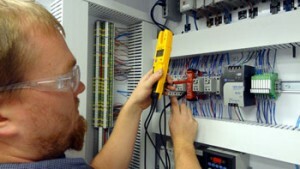 And with our ability to connect remotely to your equipment’s control system regardless of location, pending your permission, we can assist in troubleshooting a problem directly with your employees. This provides for a very cost effective means to resolve most issue that may arise. We also offer class-room training at our manufacturing location where you can actually see your equipment assembled. Depending upon the equipment, we also can perform run-offs at this facility so you can gain knowledge of its operation prior to shipment. Need Service? Our field service technicians are ready to serve and travel the globe to assist you in any way. Contact Eagle Today!